Everyone loves a Cookie, yes? There’s nothing better than sitting down with a cup of tea and one OR two freshly baked cookies. I was given this Cookie recipe a while ago and make these quite often as they’re so easy to do and they’re made with ingredients can found Readily, in most kitchens. I will often make a batch of these up ready to cook, while waiting for a cake / bundt to bake. I do a few variations on the basic chocolate Cookie. As above with mint and Aero bubble, or with a Peanut butter centre. The basic recipe is the same, then you can experiment with additional flavours/ingredients. Chocolate for topping / decoration. Preheat the oven to 180°C /160°C fan, Gas Mk 4. Line 2 large baking trays with baking parchment. In a bowl, beat the butter, caster sugar and vanilla extract together until creamy. Sift in the flour, cocoa powder and Bicarbonate of soda. Mix well to form dough. I then weigh and divide the dough into two balls so i can make 15 of each cookie (Mint & Peanut butter). You can if you like, just do all chocolate cookies. Into one ball of dough, I crush 12 Aero bubbles and mix along with the dough. Divide the ball of dough into 15 balls (again, I weigh the dough and divide by 15 to make each cookie the same) Roll into balls and place onto the baking tray (4cm apart) flatten slightly. Bake in the centre of the oven for 12-15 minutes, until firm. Once cooked, Ease the cookies off the baking tray onto a cooling rack, taking care not the break them. While they cool melt a little chocolate in a bowl, over a pan of simmering water. Cut 8 Aero bubbles in half to decorate the cookies. Add a little of the melted chocolate to the centre of the cookies to stick the half Aero bubbles on. Divide the 2nd batch of dough into another 15 balls. 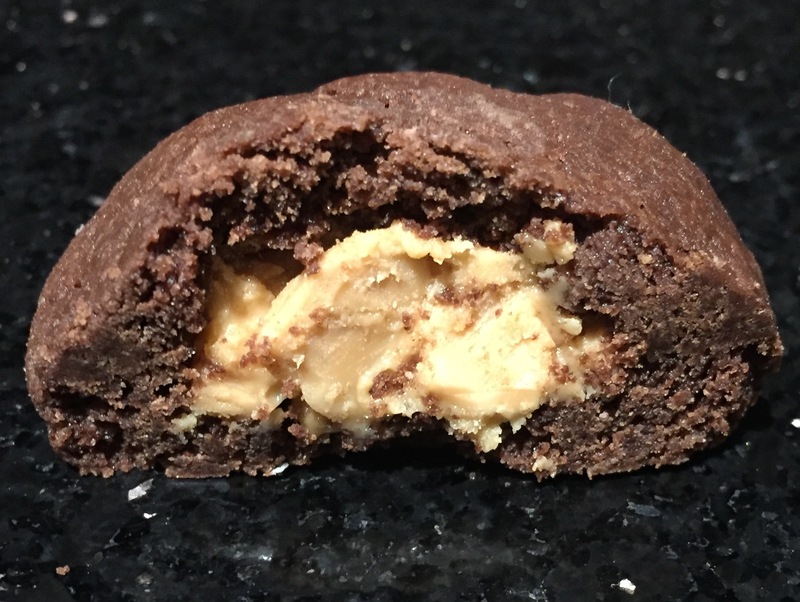 Flatten the balls slightly, then add a ½tsp of peanut butter to the centre of each cookie. Roll the dough up around the peanut butter and form into a ball. Follow step 5 and bake for 12-15 minutes. Once out of the oven, melt a little white chocolate to decorate the Cookies with. The answer to many people’s question, is Yes – the Peanut butter stays soft in the middle of the baked cookies. Now all you need is a cup of tea to enjoy these easily made cookies with. I hope this inspires you to try making a batch of these Cookies for yourself.